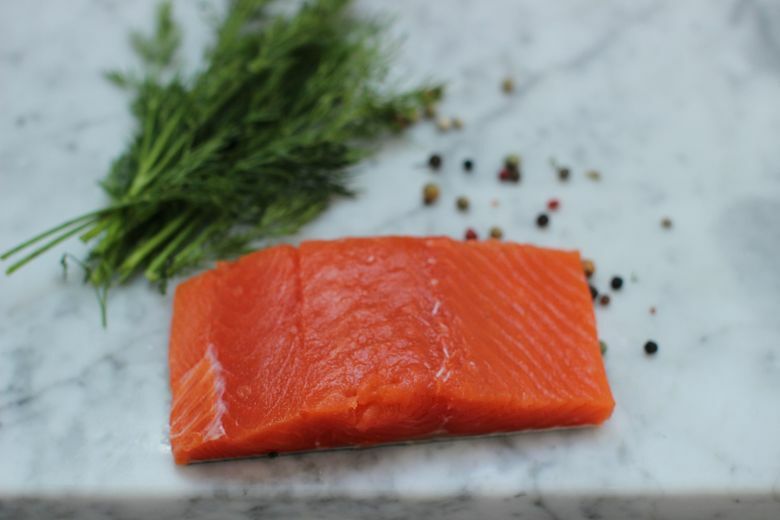 While many consumers tune in to where their food comes from, even the savviest shoppers likely don’t realize that wild Alaskan salmon boasts five varietals: king, sockeye, coho, keta and pink. Each has a distinctive flavor profile and preferred preparations. Add salmon to the long list of foods Americans have mostly lost touch with in terms of seasonality. It’s an understandable lapse. After all, salmon certainly seems to be available all year. And indeed, farmed Atlantic salmon is available fresh all year. Even wild species are available pretty much whenever a hankering strikes, albeit mostly frozen and canned. But wild salmon at its peak — about 90 percent of which comes from Alaska — indeed has a season. Fresh wild salmon — with a firm flesh and rich flavor tinged by the cold ocean — is best had from late spring through early fall. And it certainly is worth seeking out, for it has about as much in common with farmed salmon as wild, earth-ripened morels have with canned mushrooms. Thanks to its versatility with other flavors, its ease and speed of cooking, as well as a wave of good news about its healthful fats, salmon has become one of America’s go-to seafood choices. In 2013, Americans consumed 2.7 pounds of salmon per person, according to the National Marine Fisheries Service, making it the country’s second favorite seafood after shrimp. It even bumped canned tuna to No. 3. Americans eat more farmed than wild salmon, and nearly all of it is imported. Farmed salmon enjoys the advantage of being available fresh in supermarkets as consistently as steak and chicken. Its flavor is mild and filets are affordable. But advocates of wild salmon praise its flavor and its provenance as an American fish. Salmon was a staple of early Native Americans. Lots of variety, in fact. 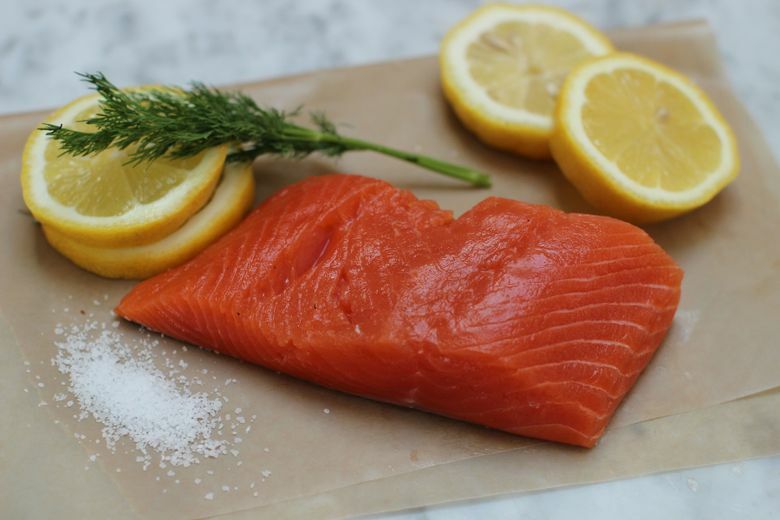 While many consumers tune in to where their food comes from, even the savviest shoppers likely don’t realize that wild Alaskan salmon boasts five varietals: king, sockeye, coho, keta and pink. Each has a distinctive flavor profile and preferred preparations. To get you ready for summer, we’ve assembled a primer on wild Alaskan salmon, complete with tips and recipes for each variety. King salmon, also known by its Native American name “chinook,” earns the title. The largest of the Pacific salmon, a single king can weigh more than 100 pounds, though typically they’re landed at 20 to 30 pounds. King salmon is prized for its silky red flesh, buttery texture and for a high oil content that gives it a luxurious flavor. King salmon from Copper River in south-central Alaska are among the first salmon commercially harvested in the state each year, and among the first to show up fresh in stores. King salmon run for three or four weeks from mid-May to mid-June. Recommended preparations: The king’s high oil content makes it tolerant of any preparation from grilling to poaching. Regardless of how it’s cooked, chefs say to go easy on the seasonings; let the fish speak for itself. Often found: You’ll see it most often in sushi; at the center of a restaurant plate; and as steaks, fillets and whole fish at fish counters. Availability: Can be found fresh and frozen throughout the year, but fresh peaks mid-May to July. Keta salmon, also called chum, has pale orange, red or pink flesh and a pronounced flavor. These characteristics make keta a favorite for drying and smoking, as well as for chowders and curries. 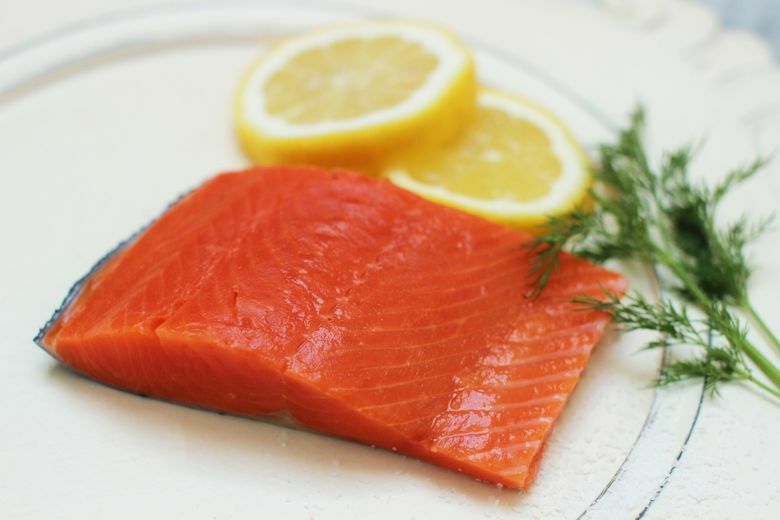 Chum has a lower oil content than other wild salmon and a meaty, firm texture. Keta roe also is used in sushi. Recommended preparations: Low cooking temperatures and taming elements such as milk or smoke are recommended for this lean fish. 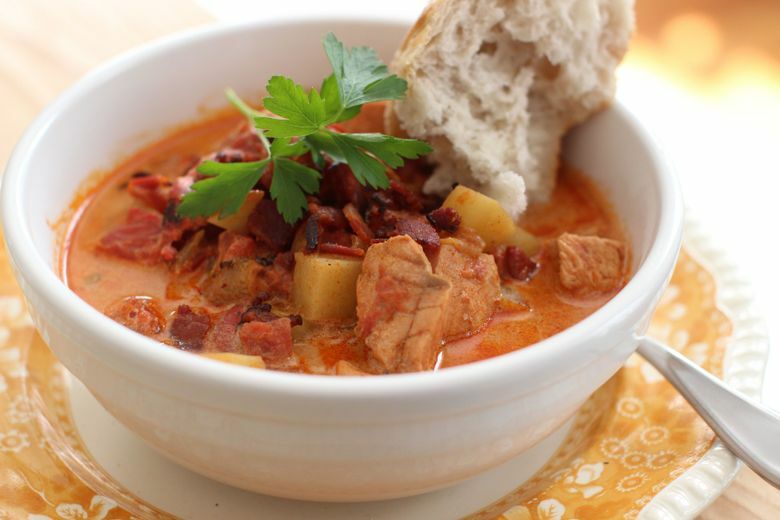 Soups, chowders and curries are ideal. Often found: Smoked; dehydrated; as jerky; in chowders, soups and curries; sushi (ikura); and as steaks, filets and whole at supermarkets. Availability: Year round frozen; fresh, June through September. Coho, also known as “silver” salmon for its bright silver sides, offers a lighter, more distinctly flavored fish than king or sockeye. 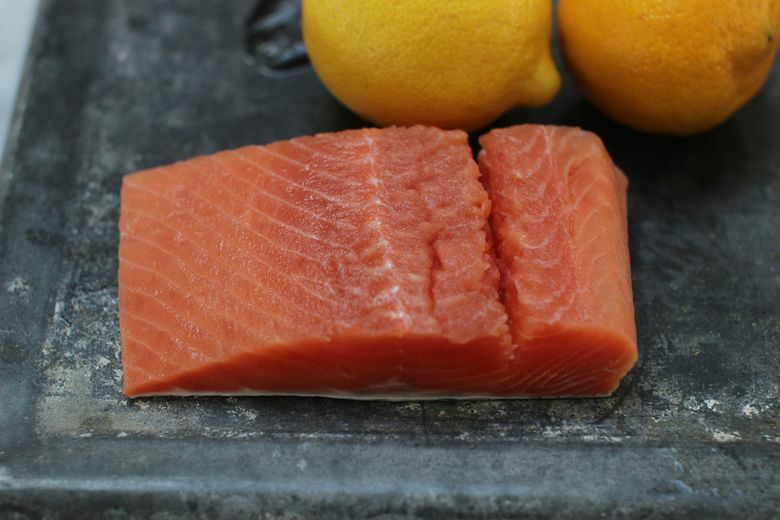 Coho’s orange-red flesh is moderately fatty and flakes well. Anita Lo, owner and executive chef of New York’s Annisa restaurant, suggests slowly poaching coho in olive oil for a softer textured fish. Recommended preparations: grilled, broiled, sauteed, poached in oil or butter, and smoked. Often found: Often smoked; in sushi as crispy salmon skin roll; as steaks, filets and whole at fish counters. Availability: Year-round frozen; fresh mid-June through late October. Sockeye, also called red salmon, is known for its distinct, bright red flesh that retains its color even once cooked. It is prized for its firm, fatty meat, and its pronounced, yet versatile flavor. Though less buttery than king, many chefs say sockeye stars on the plate just as easily. Sockeye takes well to added butter and other fats, chefs say, as well as to flavorful seasonings. Sockeye is eaten for both its meat and for its roe, which is used as salmon caviar for sushi. Nearly all of the country’s sockeye comes from Alaska, according to the National Oceanic and Atmospheric Administration, with the world’s largest harvest landing at Bristol Bay in the southwestern part of the state. Sockeye’s color and texture make it ideal for canning, but today more than half of the annual catch is sold fresh or frozen. Like king salmon, the first sockeyes of the season usually come from Copper River and hit fish counters mid-May through mid-June. Recommended preparations: Like king salmon, sockeye works with any preparation. Often found: Most often see as lox; as the sushi salmon roe called “ikura;” at the center of the restaurant plate; and as steaks, fillets and whole fish at fish counters. Availability: Year-round in cans, pouches and frozen; fresh from mid-May through mid-September. With a delicate flavor, rosy pink flesh and a texture similar to trout, pink salmon offers a blank canvas for sauces and other flavorings. 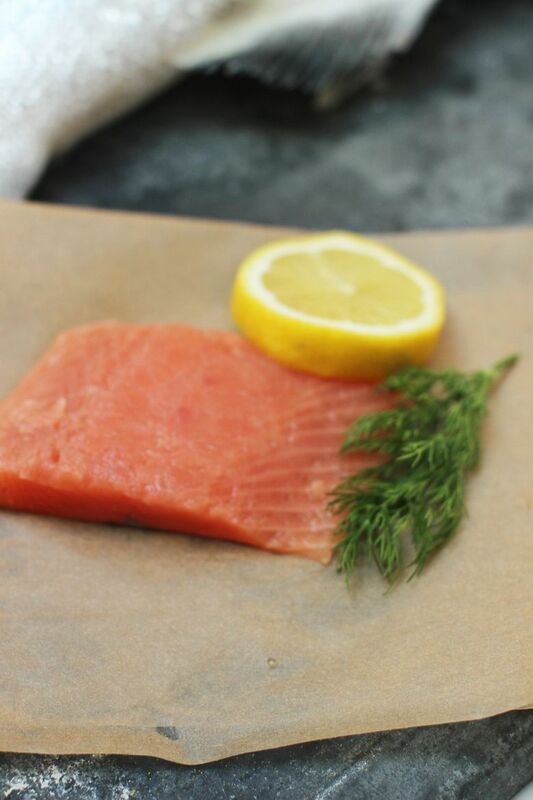 Pink salmon is extremely lean, with soft meat and a small flake. 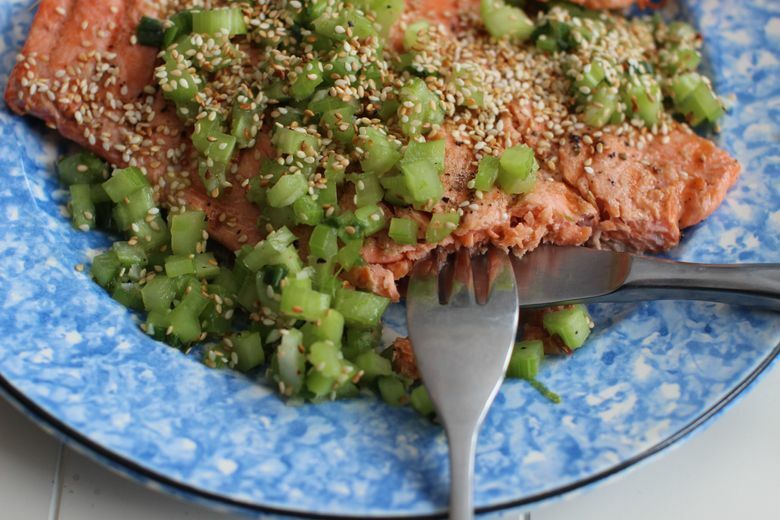 As with keta, pink salmon benefits from fat and dairy to mellow it out. The roe also is used for sushi. Often found: Shows up often in the frozen food section as salmon burgers; salmon salad sandwiches; as sushi (ikura). Available: Year-round in cans, pouches and frozen; fresh mid-June through September. Always check salmon for bones. To do this, gently rub your hand over the flesh, going against the grain. The bones should be in a line running the length of the fish. Use tweezers or needle pliers to remove. 1. Use the back of a large knife or a meat mallet to mash the lemon grass to break up the fibers. Lightly smash the garlic cloves and the ginger. 2. In a large saucepan over medium-high, combine the lemon grass, garlic, ginger, dried mushrooms, onion and water. Bring to a simmer, then reduce heat to low and cover. Cook for 15 minutes. Pour the mixture through a mesh strainer and discard the solids. Stir in the soy sauce. Set aside. 3. Heat a heavy skillet, preferably cast iron, over high heat. Add the oil and turn to coat the bottom of the pan. Sear the salmon for one to two minutes per side. 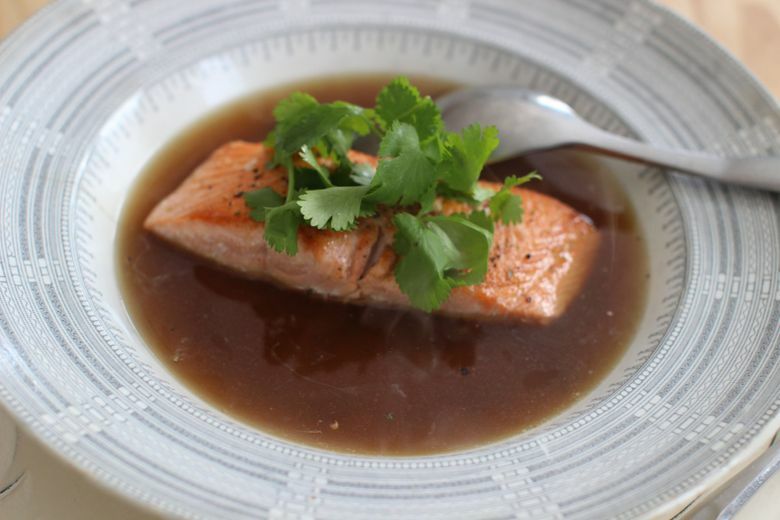 Ladle the jus into shallow bowls, placing a piece of salmon in the center of each. Top with fresh cilantro, then season with salt and pepper. Serve immediately. Nutrition information per serving: 340 calories; 200 calories from fat (59 percent of total calories); 22 g fat (3 g saturated; 0 g trans fats); 90 mg cholesterol; 4 g carbohydrate; 1 g fiber; 1 g sugar; 32 g protein; 270 mg sodium. 1. Bring the water to a simmer, then add the tea bags and remove from the heat and let steep for 10 minutes. Remove the tea bags and squeeze to extract any liquid. 2. Meanwhile, in a medium Dutch oven over medium-high, cook the bacon until crispy. Using a slotted spoon, transfer the bacon to a paper towel-lined plate to drain, leaving the fat in the pot. Add the onion, paprika, cumin and pepper flakes, then cook until the onion is tender and beginning to brown, six to seven minutes. 3. Add the potatoes, tomatoes and tea. Bring to a simmer and cook for 15 minutes, or until the potatoes are tender. Add the salmon and cook for another five minutes, or until the salmon is cooked through. Stir in the heavy cream and continue cooking just until heated through. Season with salt and pepper. Serve topped with the crisp bacon crumbles. Nutrition information per serving: 470 calories; 270 calories from fat (57 percent of total calories); 30 g fat (14 g saturated; 0 g trans fats); 105 mg cholesterol; 27 g carbohydrate; 5 g fiber; 7 g sugar; 22 g protein; 660 mg sodium. 1. Heat the grill to medium-high. 2. In a medium bowl, stir together the celery, scallions, garlic, lime zest and juice, and the toasted sesame oil. Season with salt and pepper, then set aside. 3. Brush the salmon on both sides with additional sesame oil. Season with salt and pepper. Cook the salmon on the grill for three minutes per side, or until cooked to desired doneness. Serve with the celery relish and sprinkle with toasted sesame seeds. Nutrition information per serving: 250 calories; 100 calories from fat (40 percent of total calories); 11 g fat (1.5 g saturated; 0 g trans fats); 90 mg cholesterol; 3 g carbohydrate; 1 g fiber; 1 g sugar; 35 g protein; 290 mg sodium. 1. Heat the oven to 425 F. Line a baking sheet with foil. 2. In a medium bowl, toss the sweet potatoes with the olive oil. Season with salt and pepper. Spread evenly on the prepared baking sheet and bake until tender and browned, turning occasionally, 20 to 25 minutes. 3. Once the sweet potatoes are cooked, remove them from the oven and heat the oven to broil. Spray another baking sheet with cooking spray. 4. In a small bowl, mix together the brown sugar, mustard, hot sauce and ½ teaspoon salt. Arrange the salmon pieces on the prepared pan and spread the brown sugar mixture over the top of each piece. Cook the salmon four inches from the broiler for two minutes, or until browned and cooked to the desired level. 5. Arrange 1 cup of greens on each serving plate. Top with a piece of salmon. 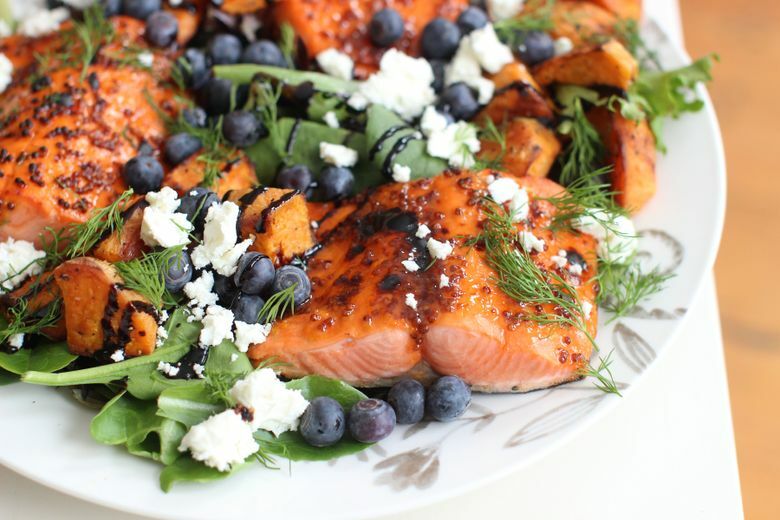 Divide the roasted sweet potatoes among the plates, along with the blueberries. Drizzle with balsamic glaze and sprinkle with feta and fresh dill. Nutrition information per serving: 360 calories; 150 calories from fat (42 percent of total calories); 17 g fat (3 g saturated; 0 g trans fats); 100 mg cholesterol; 19 g carbohydrate; 3 g fiber; 8 g sugar; 36 g protein; 400 mg sodium. 1. To make the aioli, in a small bowl whisk together the egg yolks, mustard, thyme, savory, a pinch each of salt and pepper, and the lemon zest and juice. While whisking, slowly add 8 tablespoons of the olive oil, a dribble at a time. The mixture should be smooth and thick. Adjust the seasoning with additional salt and black pepper, if needed. Refrigerate. 2. In a medium nonstick skillet over medium-high, heat the remaining 1 tablespoon of oil. Add the shallots, garlic and capers and cook until the shallots are tender and beginning to brown, three to four minutes. Transfer to a medium bowl, then add the chunked salmon and breadcrumbs. Gently mix. 3. Gently form the mixture into eight patties, each about 2½ inches round. Place some flour in a shallow dish, then one at a time set the salmon patties in the flour, turning to lightly coat both sides. 4. Return the skillet to medium-high heat and add the vegetable oil. When the oil is hot, add the patties, working in batches if necessary, and sear on both sides, four to five minutes per side. 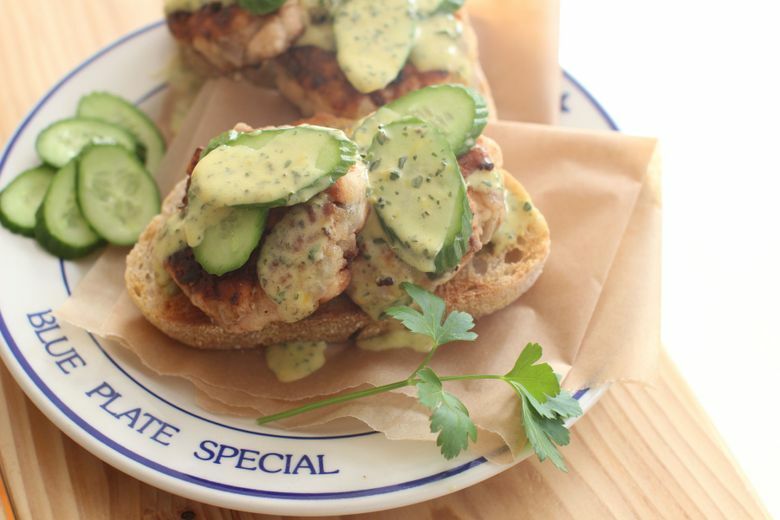 Arrange the salmon cakes on the toasted sourdough slices, topping with cucumber slices and dollops of the aioli. Serve immediately. Nutrition information per serving: 690 calories; 430 calories from fat (62 percent of total calories); 48 g fat (6 g saturated; 0 g trans fats); 180 mg cholesterol; 33 g carbohydrate; 2 g fiber; 2 g sugar; 29 g protein; 660 mg sodium.